SLO ranked as "Best College Town"
Not only is San Luis Obispo the “happiest city in America” — at least according to “The Oprah Winfrey Show” when it was still on the air — it’s also now the best town in the nation for students to spend their college years. That’s according to website College Rank, which says it helps prospective students choose a college based on various criteria, including general lifestyle categories and academics. Author Kara Mayer Robinson researched hundreds of college towns based on factors such as outdoor space, the number of boutiques and cafes, pedestrian friendliness, culture, nightlife and “the general vibe” when creating the list that included communities in 33 states. “This collegiate town on California’s scenic Central Coast has a contagious kick-back-and-relax vibe,” she wrote. “It’s not just college students who love the SLO life. Many people settle in here because of its culture, entertainment and surroundings.” Search San Luis Obispo Housing HERE! Other California college towns that made the list include Santa Cruz, which ranked ninth, and Berkeley at 11. “These top 50 cities offer college youth and energy while also providing a wonderful place to call home for life,” College Rank wrote about the assessment. Molly Kern, San Luis Obispo Chamber of Commerce’s director of communications and business education, cited San Luis Obispo’s attractive “rolling hillsides, breathtaking ocean views and spectacular beaches” in the article. Kern said Thursday that it’s great to see the city so highly touted, adding she believes the accolade was chosen from a combination of offerings: culture, arts, athletics, the outdoors, the Cal Poly campus and more. “Whether you’re a resident, a student or a visitor, San Luis Obispo is not only a place to go to college but the best town with a university to enjoy everything it has to offer,” . If you are looking to buy a home, apartment complex, condo or rent an apartment or home, please consider contacting Monique. 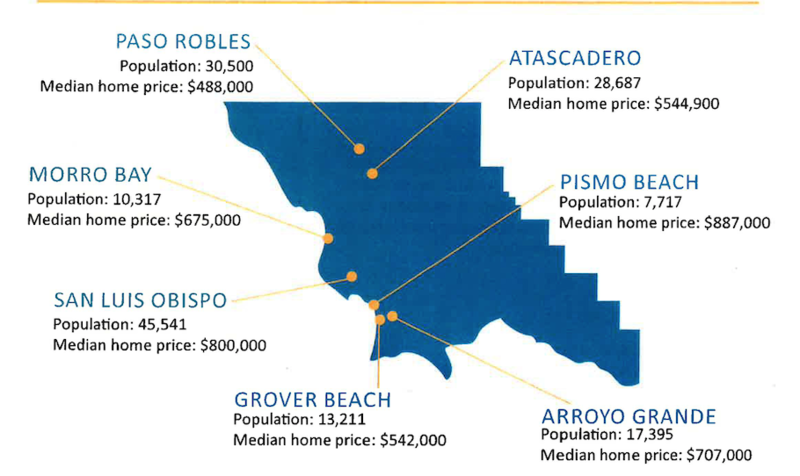 Let your investment in popular San Luis Obispo real estate pay off your student's debt or invest in your own home or retirement home in one of the best places on Earth! Monique is fortunate to have bought and sold real estate in San Luis Obispo County for several decades. Read more in the Tribune Sept. 2, 2016.